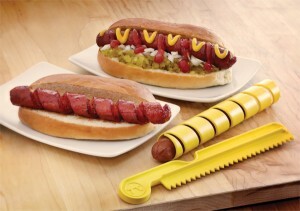 Being a self made hot dog connoisseur, I am always on the search for different ways to make them. I also end up grilling several times a year for some large groups, like this last weekend where we grilled 80 hot dogs. I had seen this youtube video below, and thought it was interesting, according to all the benefits they proclaimed, so I wanted to give it a try. I tried to use the skewer and knife technique as in the video, but without much success, so I went to the internet trying to find a better device. I found a few on Amazon, but with low ratings. I then found this brand new product from fox run brands, that worked like a charm. Once I got the hang of it, I could spiral cut a dog in seconds. Since this is a new product, I haven't found many retailers of it, as fox run brands is a wholesaler.....and I ended up buying a bunch of them, since I have a wholesaler license. I sold my extras (had to buy 25 of them) at the event this weekend, as everyone wanted one. I'm sure though, you will be able to find them individually, given a little time, as the product hits the market. Anyhow, the dogs did turn out as the youtube video proclaimed. My initial thought was, the dog may dry out since it was cut, but this was not the case. They were very juicy, maybe even more so. I was using Ball Park all beef franks from Sam's Club. They also cooked up a lot faster on the grill, as the heat gets into the crevices. Me and my friend had a great system going this past weekend, and he was grilling them as I was spiral cutting them. You just have to roll the dog a few times on the grill and they are done. As they plump up, they also expand/lengthen, opening the crevices up wider, as you see in the pics/video. They turned out just like the pics and video show. Everybody seemed to like them, and it was the conversation piece. Just sharing this with my friends here, if you want to give it a try. I am kicking myself for not taking pics of our effort this past weekend, but forgot to do it. There were 100 people at this event and I have put out a call to see if someone smarter than me has some pics. If I get them, I'll update this post. I like it! I'm going to try this out for my girls this weekend! Thanks WM!! Suppose this works for brat's to? I found the cutter here but I'm sure there must be more places that sell it. I would "suppose" it would, Turbs. When I was doing a search for a spiral cutter, I had found this one, which stated it cuts brats.....so to answer your question, it appears they are spiral cutting brats. However, this company is out of business, and I couldn't find any of their old products, even on ebay. It appears the new one I did find from fox run is very similar, but not offered in all the same sizes as the Wynders. In the video, the hot dogs were violated with ketchup !!! Here is a youtube video on the spiral cutter I did get. If you notice, they are using it on top of a towel. I recommend this, as it gives you "grip" when you are slicing the dog, and makes the coiled tube roll. I noticed that too, Chap. Honestly, I eat ketchup on just about everything, but not a hot dog or corn dog........ as these are mustard only foods. Funny thing, I store my big grills here at the shop. My guys walked in awhile ago and saw what I was doing and asked if we could grill some dogs up here for lunch. Maybe I need to start locking my office door. I have had this debate with my wife, who uses ketchup. She saw this sign when visiting Chicago. The National Hot Dog & Sausage Council states that it's a breach of proper etiquette to put ketchup on a dog after the age of 18.